UTA Strategic Planner Levi Roberts talks to Mike Zwahlen about using the bus system for his commute during an open house hosted by the Wasatch Front Regional Council on Thursday at Tooele City Hall. Clyde Christensen reviews current and proposed bicycle routes during Thursday’s transportation open house at Tooele City Hall. 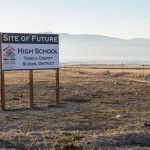 A steady stream of residents interested in, or concerned with, the future of transportation in Tooele County attended an open house hosted by the Wasatch Front Regional Council on Thursday. 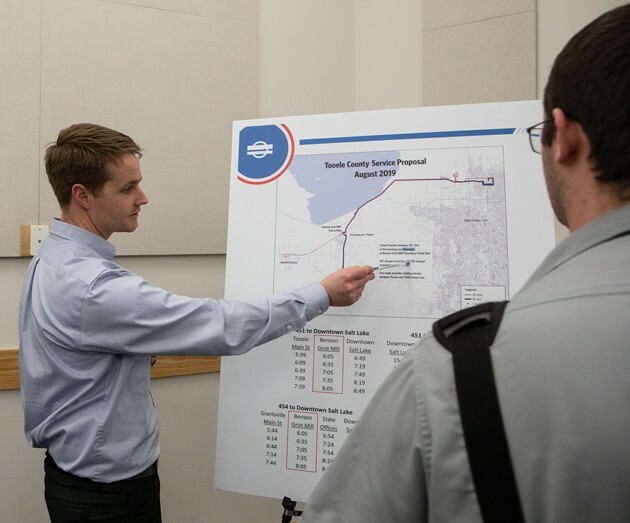 The open house, held at Tooele City Hall, ran from 4:30-6:30 p.m., with representatives from the regional council on hand to answer questions about the long-range transportation plan for Tooele Valley. Large maps of the proposed transportation projects through 2040 were available for review, and to place comments on. The online, interactive version of the project map was available at the open house as well. The interactive map is available at wfrc.org/tvlrtp-2019-draft. Public comment will be accepted through Feb. 13. 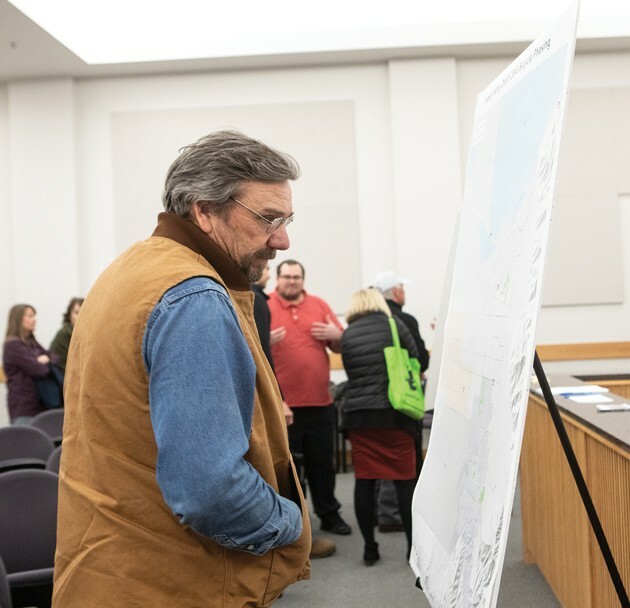 There was a lot of interest and a variety of comments expressed during the open house, according to Wayne Bennion, director of short-range planning and programming at Wasatch Front Regional Council. Bennion said some residents had questions about lines depicting future roads and the location of projects, while some showed support for projects identified as priorities. 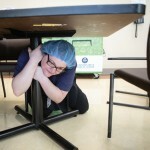 He said everyone who spoke with a Wasatch Front Regional Council representative was encouraged to also fill out a comment card or comment online to document the feedback. He said comments are considered prior to the finalization of the plan, which is expected sometime this summer. While the plan includes proposed projects through 2040, he said there will likely be another update to the long-range transportation plan in the next several years. The comment cards, which also included adhesive notes placed on the maps, provided an anonymous look into residents’ priorities regarding transportation. 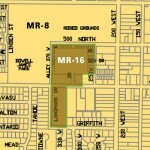 “The people who own these houses don’t want it in their back yard,” one note said, near the proposed route of the Oquirrh Expressway. Another note suggested connecting the Oquirrh Expressway to Smelter Road. Newly elected Tooele County commissioners Tom Tripp and Kendall Thomas also attended the open house. There will be another study completed by the Utah Department of Transportation that will look at congestion mitigation and transportation options beginning this year, Tripp said. While he clarified neither study is county funded, Tripp said the commissioners are interested in them. Thomas said the conceptual plans included in the study have caused people possibly affected by them to speak out. A number of high-profile proposed projects to create new roads, or expand existing ones, are included in the draft plan, including the Midvalley Highway and an alternate connection between Lake Point and state Route 201. The first phase of the $75 million Midvalley Highway, which connects I-80 and state Route 138, is expected to begin this year. The plan also includes a proposed widening of Interstate 80 from state Route 36 to SR-201, and between SR-36 and Midvalley Highway. In addition to road infrastructure, the plan includes a feasibility study to review high-capacity transit between Salt Lake and Tooele counties.